"You couldn't ask for a better natural laboratory to study particle acceleration in a continually changing environment – at energies far beyond anything we can produce on the Earth," said Holder, a professor in UD's Department of Physics and Astronomy. Astronomers discovered more than 100 years ago that accelerated particles exist, yet how or where these particles speed up remains a mystery. Pulsars are among the most extreme objects in the universe and they have magnetic fields around them that are millions of times stronger than anything scientists could hope to build on earth. When a pulsar encounters dust or gas close to a massive star, the particles nearby accelerate — to near speed of light velocities — and collide with what's around them. The result is a beam of high-energy light called gamma-radiation or gamma rays. By measuring these radio pulse frequencies, astronomers were able to tell how fast the pulsar was moving and calculate exactly when it would be closest to the massive star that it was orbiting — Nov. 13, 2017. It's a trip that took 50 years. Holder and Williamson realized that the pulsar was doing something different each day. 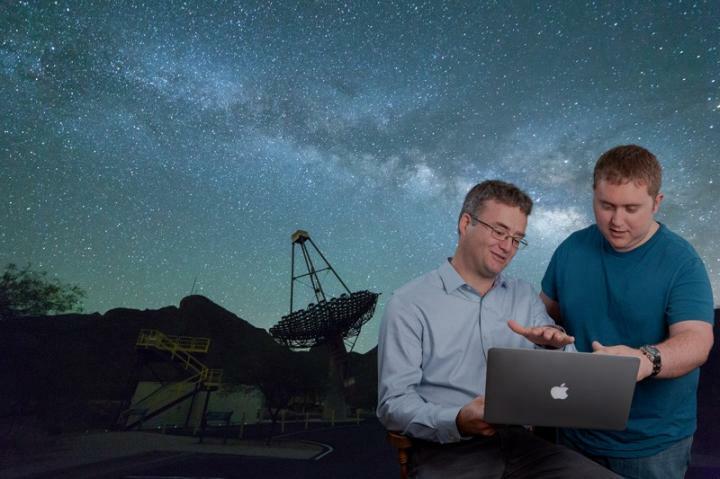 "Tyler is, without a doubt, the luckiest graduate student I've ever met because this event that happens only once every 50 years — one of the most exciting things we've seen with our telescopes in a decade — occurred right in the middle of his doctoral work," said Holder.